Drivers need to take into account anything from frost to heavy snow. So, we’ve put together a short myth busting guide to give you some top winter driving tips – offering advice on skidding, snow, fog and much more. 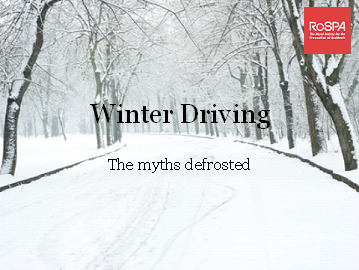 Why not check out our winter driving blog for more detail on each of these myths or visit the RoSPA website for more winter driving tips. Don’t forget RoSPA’s winter safety hub offers even more advice on staying safe during the winter months not only on the road but around water, during leisure pursuits, at work and in the home (including Christmas safety).